Home > Campus News > MET expands its footprints! 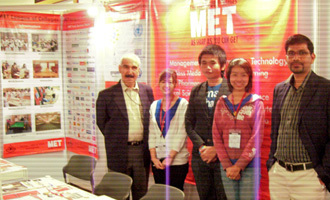 Mumbai Educational Trust participated in the TOI – India Education Expo 2009-10 at Thailand on 12 & 13 December 2009. There were over 30 participants from India. MET League of Colleges impressed and surpassed the likes of Symbosis, IIPM, Kohinoor, Chopra’s, Crema, Frame Boxx etc. with its large presence.